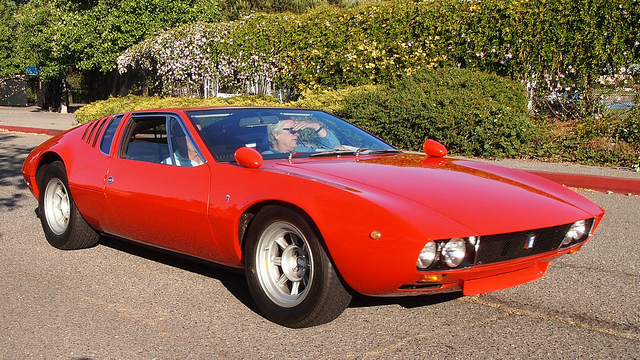 The De Tomaso Mangusta is a sports car from Italian automobile manufacturer De Tomaso produced between 1967 and 1971. The Mangusta name was revived in the early 2000s when the concept car De Tomaso Biguà became the Qvale Mangusta, after a dispute between De Tomaso and business partner Qvale. The Qvale sold only in limited numbers. Originally fitted with Ford 289 V8 engine mid-mounted 306 horsepower (228 kW) (EU version), in the North American market the Mangusta was introduced with a Ford 302 V8 engine 221 horsepower (165 kW), driving through a 5-speed ZF transaxle. Giorgetto Giugiaro designed the car, which is easily recognised by its gull wing doors over the engine and luggage compartment. Disc brakes were standard at all four corners. Four wheel independent suspension, rack & pinion steering, A/C, power windows, were ahead of other manufacturer of the time. Journalist Paul Frère claimed he achieved a top speed of 250 km/h (155 mph). 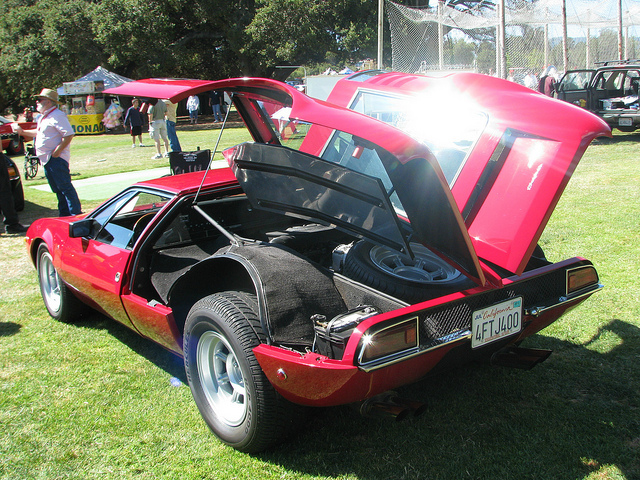 The Mangusta was relatively inexpensive for the time but, with a 32/68 weight distribution and a less than solid chassis, suffered from stability problems and poor handling. The car was also cramped and had extremely low ground clearance. By the way De Tomaso Mangusta appears in “Gone in 60 Seconds” (1974) as one from the List of the cars to be stolen, in Quentin Tarantino’s “Kill Bill vol. 2” (2004) as a Bill car, and in a number well-known films and TV shows, and in Kylie Minogue “Can’t Get You Out of My Head” (2001) music video.